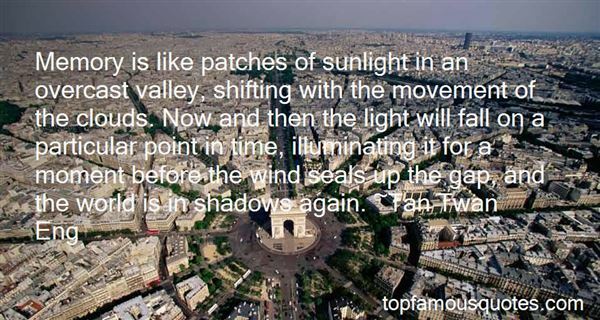 Reading and share top 7 famous quotes and sayings about Sunlight And Shadows by famous authors and people. 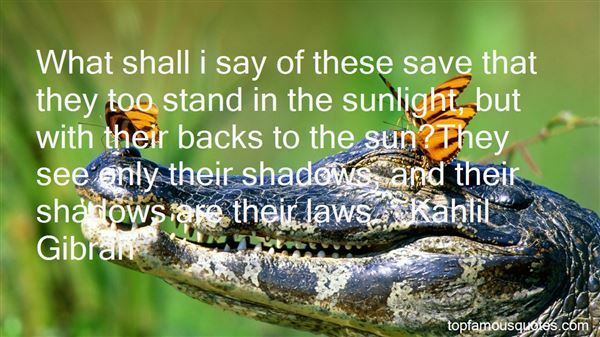 Browse top 7 famous quotes and sayings about Sunlight And Shadows by most favorite authors. 1. "If you walk on sunlight, bathe in moonlight, breathe in a golden air and exhale a Midas' touch; mark my words, those who exist in the shadows will try to pull you into the darkness with them. The last thing that they want is for you to see the wonder of your life because they can't see theirs." 2. "I think of the view from a favorite arroyo in the late afternoon, the east slope still bathed in sunlight, the far slope already full of dark shade and lengthening shadows. A cool breeze, as one can look across the plains, out over miles of homes and trees, and hear the faraway hum of traffic on the high-ways and see the golden light filtering through the mist-laden air." 3. "In The Republic, Plato imagines human beings chained for the duration of their lives in an underground cave, knowing nothing but darkness. Their gaze is confined to the cave wall, upon which shadows of the world are thrown. They believe these flickering shadows are reality. 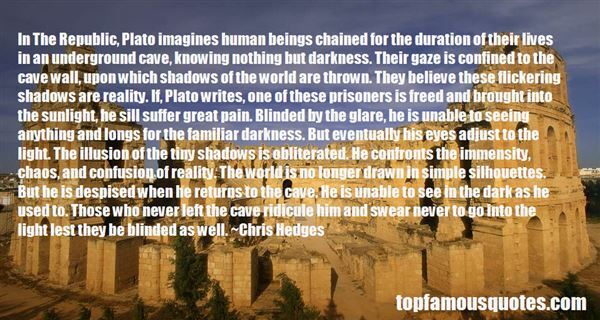 If, Plato writes, one of these prisoners is freed and brought into the sunlight, he sill suffer great pain. Blinded by the glare, he is unable to seeing anything and longs for the familiar darkness. But eventually his eyes adjust to the light. The illusion of the tiny shadows is obliterated. He confronts the immensity, chaos, and confusion of reality. The world is no longer drawn in simple silhouettes. But he is despised when he returns to the cave. He is unable to see in the dark as he used to. Those who never left the cave ridicule him and swear never to go into the light lest they be blinded as well." 4. "Solo For Ear-Trumpet The carriage brushes through the brightLeaves (violent jets from life to light);Strong polished speed is plunging, heavesBetween the showers of bright hot leavesThe window-glasses glaze our facesAnd jar them to the very basis — But they could never put a polishUpon my manners or abolishMy most distinct disinclinationFor calling on a rich relation!In her house — (bulwark built betweenThe life man lives and visions seen) — The sunlight hiccups white as chalk,Grown drunk with emptiness of talk,And silence hisses like a snake — Invertebrate and rattling ache….Then suddenly EternityDrowns all the houses like a seaAnd down the street the Trump of DoomBlares madly — shakes the drawing-roomWhere raw-edged shadows sting forlornAs dank dark nettles. Down the hornOf her ear-trumpet I conveyThe news that 'It is Judgment Day! ''Speak louder: I don't catch, my dear. 'I roared: 'It is the Trump we hear! ''The What?' 'THE TRUMP!' 'I shall complain!…. the boy-scouts practising again." 5. "Although it was autumn and not summer the dark-gold sunlight and the inky shadows, long and slender in the shape of felled cypresses, were the same, and there was the same sense of everything drenched and jewelled and the same ultramarine glitter on the sea. I felt inexplicably lightened; it was as if the evening, in all the drench and drip of its fallacious pathos, had temporarily taken over from me the burden of grieving." 6. "What shall i say of these save that they too stand in the sunlight, but with their backs to the sun?They see only their shadows, and their shadows are their laws." 7. "Memory is like patches of sunlight in an overcast valley, shifting with the movement of the clouds. Now and then the light will fall on a particular point in time, illuminating it for a moment before the wind seals up the gap, and the world is in shadows again."